I’ve always been drawn to comets. Maybe it is their unpredictability. Even the most well-behaved comets can unexpectedly split into multiple pieces, brighten by orders of magnitude, or even just fizzle away into nothing. A recent find is a perfect example of a comet seemingly rising from out of nowhere to be one of the year’s most interesting objects (at least so far…). On the night of April 16 UT, Slovenian astronomer Jan Vales detected a normal looking 12th magnitude asteroid. Normal in that it was moving at a rate that was typical for a run-of-the-mill object in the asteroid Main Belt. The weird thing is it wasn’t known. All the asteroids this bright were found years ago (in fact ~70 years ago). In fact, this object is so bright that I should be able to see it in my 12″ telescope without the use of a digital camera. 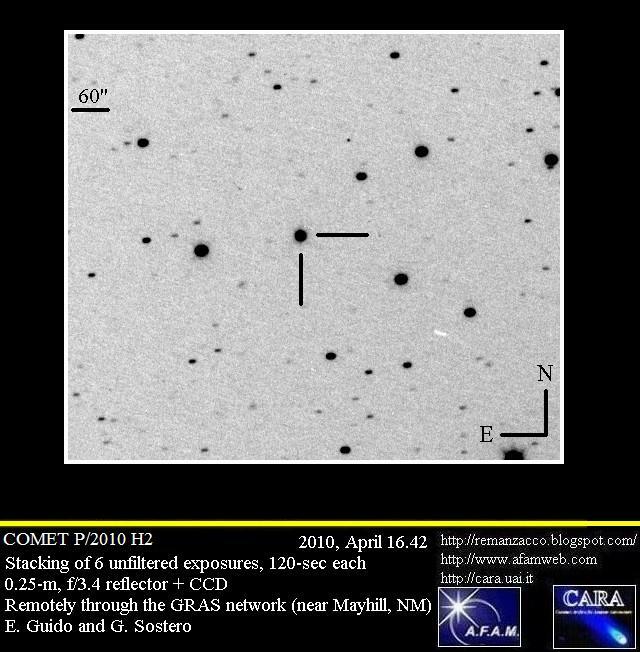 As the image below shows (taken by Italian astronomers Ernesto Guido and Giovanni Sostero with a remote telescope in New Mexico), the object sure looks like an asteroid. As further observations came in, more and more observers started to note the object was slightly more diffuse than the background stars… and growing in size. CCD observations of Comet Vales. Credit: E. Guido and G. Sostero. The only explanation is a recent outburst from previously unknown comet. Only a night earlier, the Catalina Sky Survey searched the part of the sky containing the comet but found no trace of it. If it had been brighter than magnitude 20.1 it would have been seen. Since the comet is now magnitude 11.5 to 12.0, this means it brightened by a factor of ~200 in under 24 hours. Though comet outbursts (outburst being the usual term to describe a sudden increase in the activity or dust/gas release of a comet) are common, such dramatic outbursts are fairly rare. At this early stage the outburst is very similar to that of Comet Holmes which experienced outbursts in 1892, 1893, and 2007. Note, that although Holmes became bright enough to be seen with the naked eye, this outburst will probably always require a large backyard telescope to be observed. The comet now known as P/2010 H2 (Vales), or just Comet Vales, circles the Sun once every 7.6 years. It’s orbit takes it to within 3.09 AU of the Sun (3.09 times further from the Sun than the Earth’s distance). It’s orbit is similar to those of the Hilda asteroids. Hildas orbit the Sun 3 times for every 2 times that Jupiter orbits the Sun. As a result, Hildas are on stable orbits and can stay away from Jupiter for billions of years. The orbit of Comet Vales is similar but slightly different from the Hilda asteroids. This suggests that it is in a pseudo-Hilda orbit. Comets can sometimes be perturbed into Hilda-like orbits that are stable for years, and sometimes centuries, but ultimately will be kicked out of this orbital configuration by a future close approach to Jupiter. As more observations come in, the orbit of Comet Vales will be refined and we should learn more about its past and future. 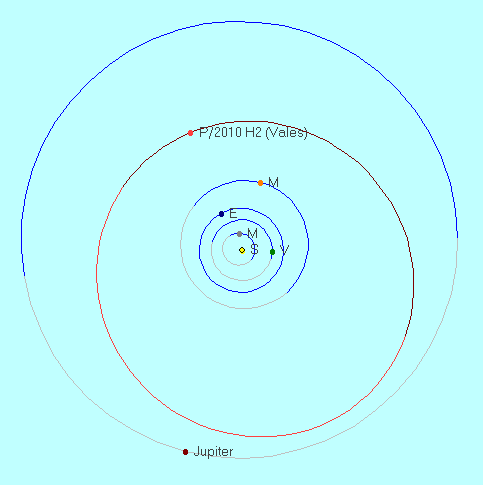 Orbit and position of Comet Vales, valid for April 19, 2010. Created with C2A. Credit: Carl Hergenrother. In the meantime, it will be interesting to watch the dust released by Vales’ outburst slowly expand. Perhaps it will even resemble the dust shells of Comet Holmes as seen in these pictures I took back in 2007.